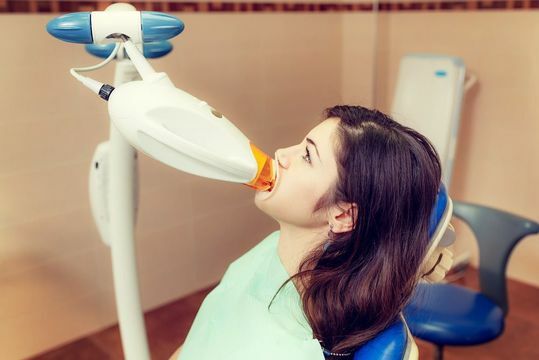 If you are seeking to experience a bright, beautiful smile, Dr. Jon Marc Van Slate offers professional teeth whitening options at his Houston, TX, practice to achieve your goals. We offer both in-office and take-home treatments from renowned brands such as Zoom!®, KöR®, and Philips NiteWhite. To schedule a whitening consultation with Dr. Van Slate, contact our practice today. Zoom!® is the number-one patient-requested whitening procedure in America, and a single treatment session at our practice can brighten your smile by several shades. To begin your minimally invasive treatment, we will first use a shade guide to identify the current color of your smile and determine the appropriate strength of whitening gel. Next, we will apply the Zoom!® whitening gel to the surface of your teeth. We will then use an innovative light to activate the bleaching agents and break up stain-causing molecules. After the gel is removed, we will repeat the process two more times. An entire treatment can typically be completed in an hour or less. Rather than visiting our practice for a whitening treatment, some patients prefer the convenience of an at-home kit. If you choose Philips NiteWhite, we will provide a custom set of trays and a professional-strength whitening gel. You will simply line the inside of the trays with a small amount of the whitening solution and wear them while you sleep, stopping after a prescribed period of time. When compared to over-the-counter whitening gels or strips, the NiteWhite system can achieve more dramatic results during a much shorter time span. We offer the KöR® whitening system for patients who want to combine in-office and take-home treatments. To begin, we will first create a set of custom whitening trays that will be specially designed to prevent gum irritation. Your practitioner will use the trays to perform an in-office whitening. After this procedure, you will return home with your custom trays and KöR® bleaching gel. Over the coming weeks and months, you can use the kit to perform touch-ups at home. Our whitening options are designed to help you achieve your goals and fit within your budget. It is important to keep in mind that the results of professional teeth whitening are not permanent. Fortunately, there are some strategies you can follow to help maintain your newly brightened smile. Certain foods and drinks like coffee, berries, and soda can darken enamel over time, so you should do your best to avoid them. In addition, you should rinse your mouth after every meal and be sure to brush and floss regularly. Smoking can greatly compromise the appearance of teeth and lead to a range of oral health concerns, so we strongly recommend that patients quit. A bright, sparkling smile can enhance your overall appearance and help to improve your self-confidence. Our whitening options are designed to help you achieve your goals and fit within your budget. To schedule an appointment, or learn more about teeth whitening, including costs, contact our friendly office staff today.